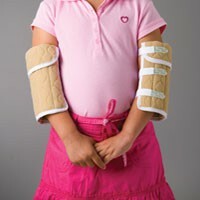 These Elbow Splints are sized for infants and children up to seven years old. Manufactured by Posey, they provide comfortable padded support for elbows in need of an external limb splint. The quilted material of these Elbow Supports can be pinned to a patient's clothing to help hold the splints in position. Because they are machine washable, stiffeners inside the splints can be removed when laundering the splints. Splints secure around the patient's elbows using hook and loop fasteners. See additional splint specifications below.